Big Viking Games is looking for a talented Full Stack Mobile Developer with a passion for gaming to join our Toronto studio. 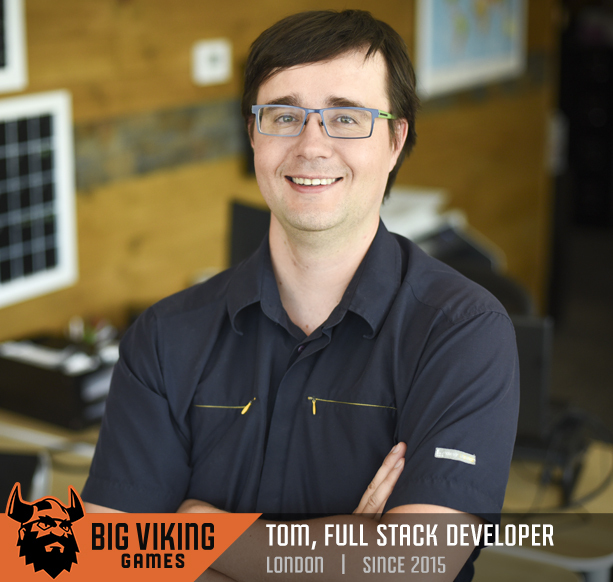 To get a better idea of what life is like for a Full Stack Developer at Big Viking Games, we asked Tom to tell us a bit about what inspired him to become a Viking and what keeps him motivated. What advice would you give to other developers who are wondering how to work in the gaming industry? First off: never stop learning! Go to school and get a good base in computers and programming. But don’t limit your studies to your classes. Read up on games and the gaming industry, try games you normally wouldn’t play—from the complex to the simple—and develop a critical eye for what makes each one a good or bad game. Next, try your hand by making some simple games by following some tutorials, and then share all your work in an online portfolio on github (or a similar service). Finally, and this might seem counter-intuitive, but: embrace the mistakes you make! When you make an online profile of your work, share ALL of it—even the stuff that didn’t work out! What made you decide to apply for a job at Big Viking Games? My background was not in the game industry, but I’d always loved games so I was really interested in the BVG posting for a Full Stack Developer. I was impressed by what was being offered—both in terms of my responsibilities, as well as the perks and the company culture. All together, it just seemed to be something I didn’t normally encounter. So I applied, and it was one of the best decisions I have ever made. What’s it like working as a Full Stack Developer at Big Viking Games? As a Full Stack Developer at Big Viking Games, the biggest challenge is creating games for a range of different platforms and technologies. A game may run like lightning on one browser, but barely work on a given mobile device, and it’s my job to figure out why. I really enjoy the challenge this provides. I am constantly learning: new tools, new languages, and new programming best practices. I see the combination of evolving technology and a variety of platforms as an ever changing puzzle that I need to solve every day. When I bring everything together and nail a solution, it’s very rewarding! How does Big Viking Games differ from other companies you’ve worked for? I find working at Big Viking Games to be both fun and challenging. You have to be able to change and adapt at all times: listening to the players of your game and reacting to them to make their experience as memorable as possible. The culture at Big Viking is definitely different from other places I’ve worked. I always get to work on something new, and everyone gets excited about this variety. What’s more, everyone loves games, which makes it a fantastic place to work. My favourite game of all time is Civilization 4 (well, the the whole Civ series, actually). I’ve always loved history, and the Civ series has consistently been one I could play (and have played!) for hours. To join our viking horde as our next Full Stack Mobile Developer, Apply Now!